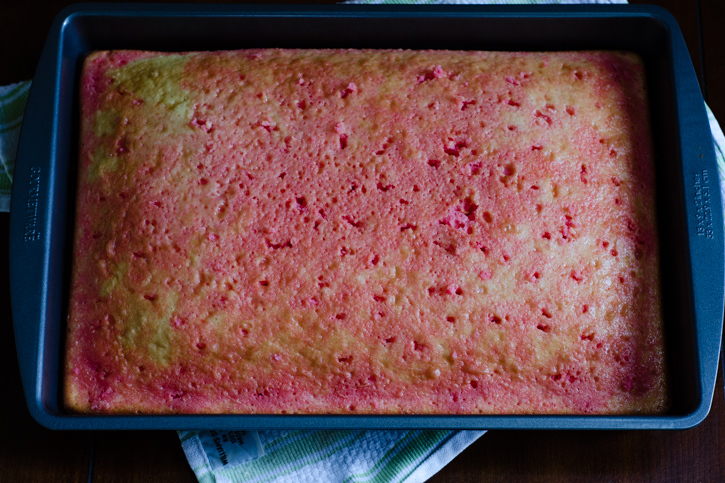 This week, I was tasked with making a “pink cake with pink frosting” for a certain someone’s sixth birthday party. I’ll be honest with you … I was stumped. I block cakes out of my head for the 362 days of the year I’m not required to bake them. The rules bog me down and then I overthink instead of being all passionate about the food in that Chocolat way, and what comes out is a sagging, timid, insecure little thing instead of the Martha Stewart Weddings-quality towering masterpiece I was envisioning. 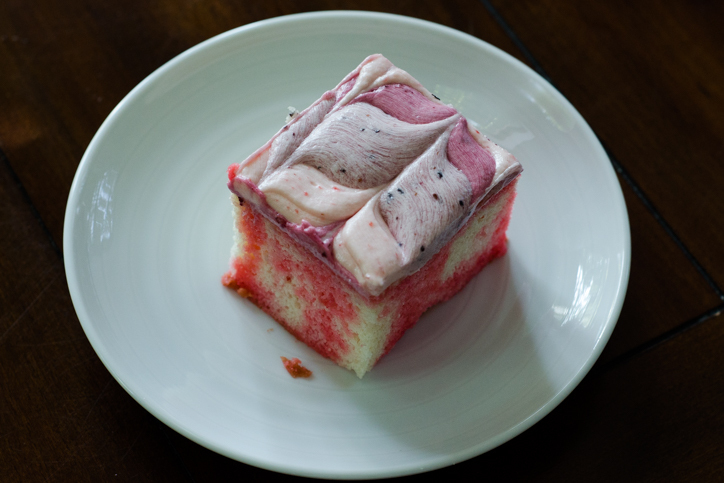 Then I remembered the flavorful (and PINK) strawberry cake my friends surprised me with on my birthday this year. 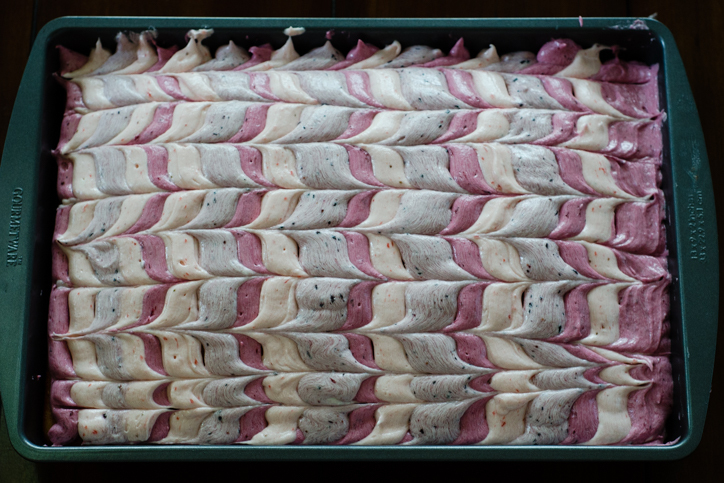 My mom used to make one like this too, waaaay back in the day, with pinky streaks of Jell-O swirled throughout. 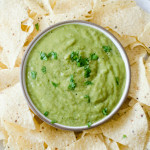 So I called her up and listened to her usual, vague, two-sentences recalling what she may or may not have done, followed by backtracking because she’d confused her actual steps with another recipe she ripped out of a magazine somewhere along the way and filed away in her 3-ring “recipes to try” binder. Normally, I love, LOVE her vagueness. My mom and I tend to play off each other in the kitchen, completely winging it as we go along, improvising with what we have on the shelves and never scribbling down a single step. No overthinking here, just acting and reacting, without pausing to look at directions or wonder if the food will look like picture in the book, because the picture is only in my head, and it’s constantly changing as ingredients and cooking methods change on a whim. Only, this is baking, and six is an important birthday and I wanted it to be right. And, if I’m being honest, when you attend a birthday party hosted by someone who used to cook professionally, you sort of expect that everything will taste great AND look like it was ripped from a glossy zine. There are reputations to uphold here. So, I compromised. 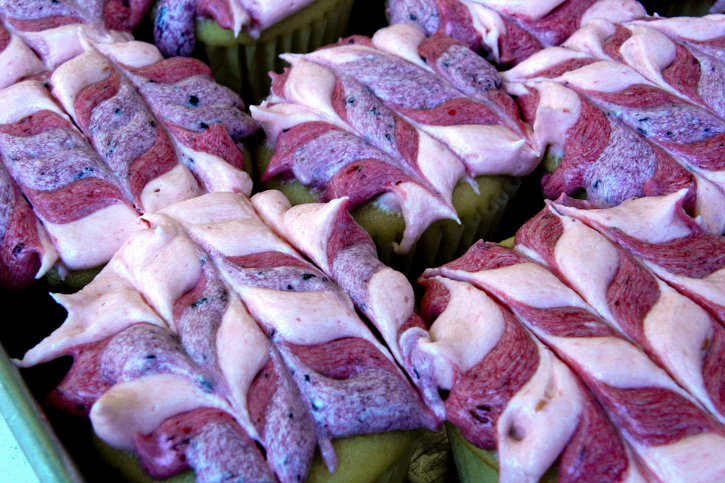 I winged the cake and followed directions from Deb Perelman’s The Smitten Kitchen Cookbook for the Triple Berry Buttercream Frosting, a genius recipe that looks AND tastes great with natural, vibrant pink hues that come from pureed fresh berries. Then, I wrote everything down so I could share it with you, in case you want to get it right for the pink-lover in your life. 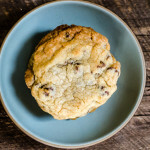 This dump-it cake comes together quickly and bakes to perfection every time. You really can't overcook it because then you maim it with holes and pour in the Jell-O liquid, which makes it spongey and moist no matter what. The frosting is a dream for the decorationally-challenged. Pipe lines horizontally across the top, then drag a toothpick through the lines like your neighborhood coffee barista does in your morning cappuccino. The design is fun and sophisticated at the same time. I've also tried this method on cupcakes to equally great effect (see photo at bottom). 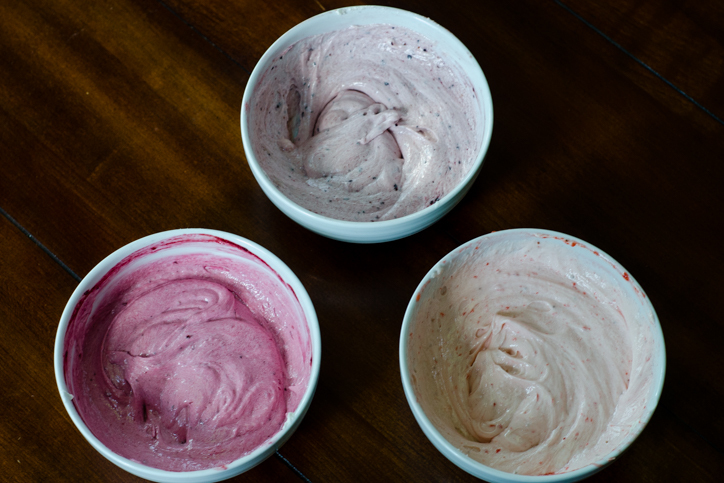 And, I've used raspberry puree instead of strawberry for a more vibrant pink color (Blackberries and raspberries make the brightest frosting colors). The buttercream frosting yields about 3 cups, enough to decorate one 13x9 inch cake. Preheat the oven to 350 degrees (325 degrees if using a dark or nonstick pan) and position a rack in the middle of the oven. Grease a 13x9 inch pan. Pour the cake mix into a medium bowl and make a well in the center. Add the oil, water, and eggs, and beat with a hand mixer on low speed for about 20 seconds until the cake mix is mostly incorporated into the wet ingredients. Increase the speed to medium and beat for three more minutes, stopping once or twice to scrape down the sides of the bowl. Pour the batter into the greased pan and slide into the oven. Bake for 24 to 28 minutes, depending on the color of your pan. The cake is done when it begins to turn golden brown and pulls away from the sides of the pan. A toothpick inserted into the center should come out clean. 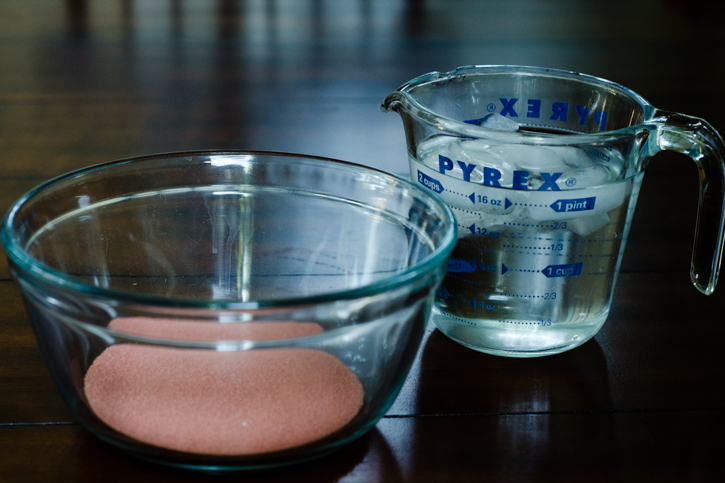 Pour the Jell-O powder into a small bowl. Pour 1 cup boiling water into the bowl and stir to dissolve the powder, about 2 minutes. Once the powder has dissolved, add 1 cup of ice water to the bowl and stir to combine. Set aside. 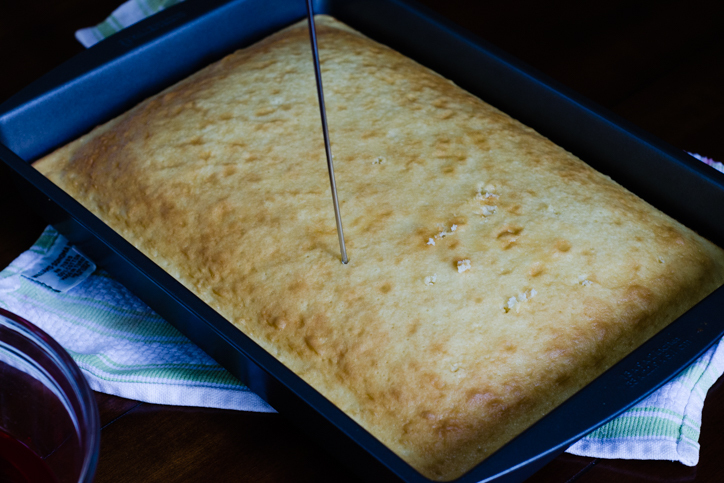 Allow the cake to cool for 10 to 15 minutes, then, using a skewer, fork, or toothpick, poke holes all over the top of the cake. Once the Jell-O has cooled to room temperature, pour 1½ cups of the mixture evenly over the top of the cake and let it soak in. 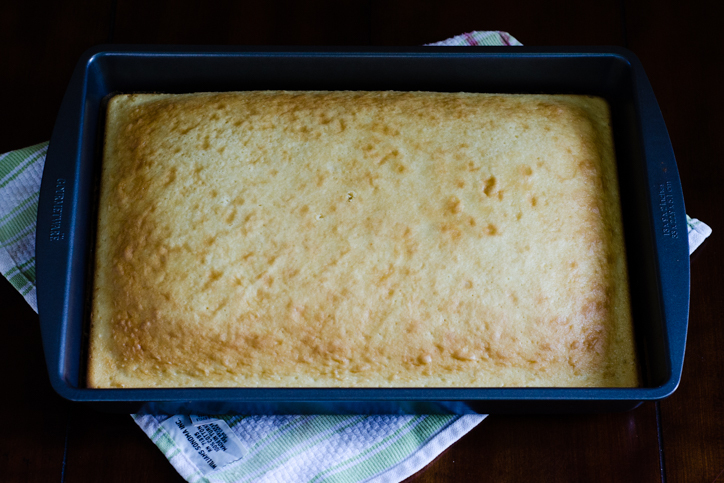 Allow the cake to finish cooling to room temperature, about 2 to 4 hours. 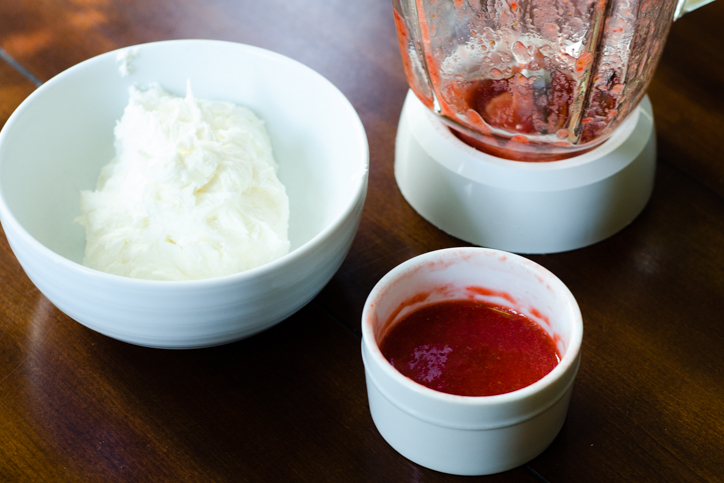 Add the strawberries to the bowl of a blender or food processor and puree. Strain into a small bowl. Rinse the bowl of the blender/processor and repeat with the other two berries. 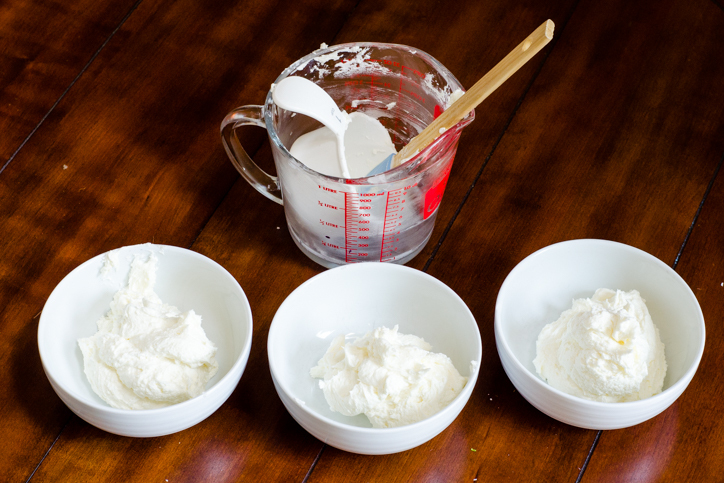 Beat the butter in a large bowl with a hand mixer on medium speed until smooth and fluffy, about 3 minutes. Add the sugar, one cup at a time, beating each time until fully incorporated (you may need to initially reduce the beater speed to low to keep the sugar from spraying everywhere). Once all of the sugar is fully incorporated, divide the frosting into three small bowls, about 1 cup per bowl. 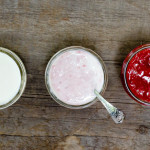 Add 1 tablespoon + 1 teaspoon of strawberry puree to the first bowl, blueberry to the second, and blackberry to the third, stirring with a spoon or spatula until fully incorporated. The frosting may be refrigerated at this stage, up to several hours in advance. When ready to frost, microwave for 7 seconds and stir to loosen it up. 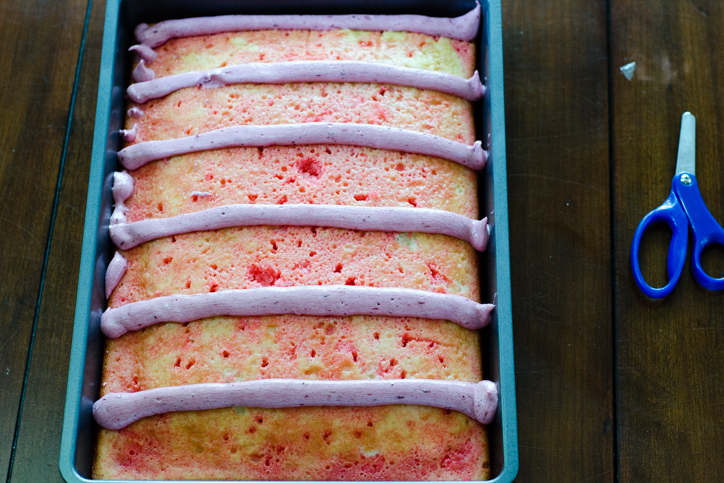 Add all of one frosting color to a piping bag or a plastic sandwich bag*. Pipe one thick line across the width of the cake, then make two dots as placeholders for the next two colors. Pipe a second line under the second dot and add two more dots. Repeat until you get to the end of the cake. 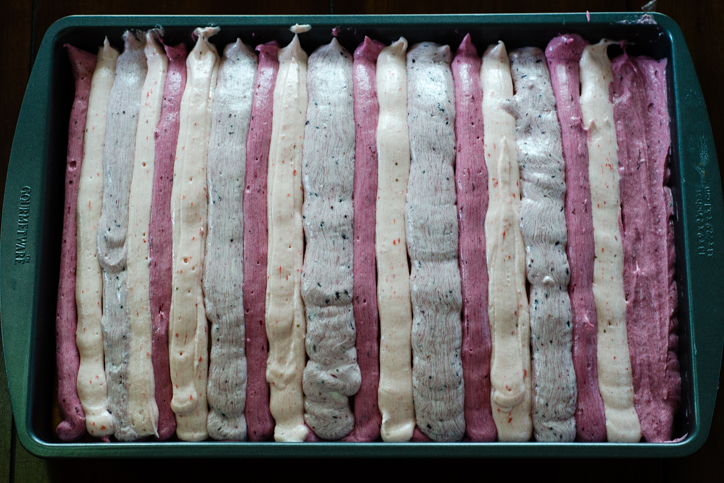 Switch to the second frosting and pipe lines directly under the lines you've already piped. Repeat with the third color. If there are any accidental spaces, just add a new line with one of the colors. Once all of the lines have been piped, take a wooden skewer or toothpick, and lightly draw vertical lines down the length of the cake, alternating the direction of each line. Refrigerate to firm up the frosting if it appears too soft. Cut into 16 squares and serve. The frosted cake can be assembled up to a day in advance. *If you don't have a piping bag, scoop each frosting color into a different plastic sandwich bag and slice 1/4-inch off the tip of one corner of each bag, with a sharp knife or pair of scissors. This way, you don't have to deal with washing out your piping bag or round tip with each frosting color.